It’s a happy happy Christmas to all of you as the duo of fun is back. Vic Sotto and Ryzza Mae Dizon are back for their Metro Manila Film Festival entry. ‘Bossing’ Vic Sotto and the ‘ Aling Malliit’ Ryzza Mae Dizon will be starring on the comedy-fantasy film “My Big Bossing”. “My Big Bossing” is the sequel of the last year’s MMFF entry “My Little Bossing”. 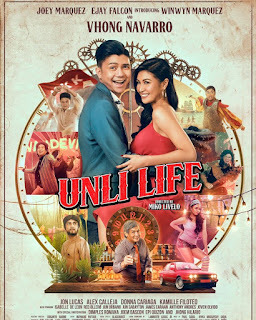 The two will be joined by Marian Rivera, Pauleen Luna, Manilyn Reynes, Wally Bayola, Jose Manalo, Paolo Ballesteros, Nikki Gil, Alonzo Mulach, Zoren Legaspi, Niño Mulach, etc.. The movie will be directed by Tony Y. Reyes, Marlon J. Rivera, and Bb. Joyce Bernal. It will be produced by M-Zet Films and APT Ent. with the distribution of Octoarts. 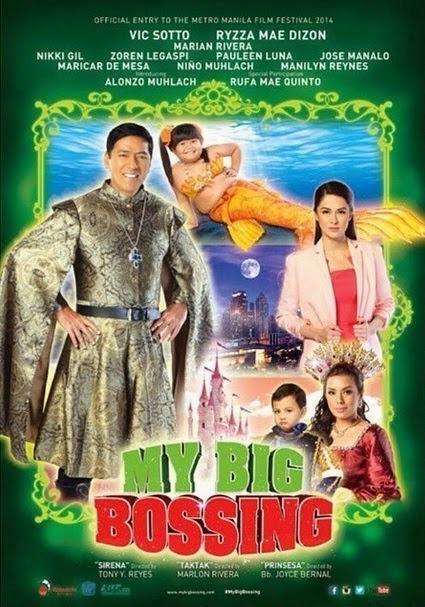 “My Big Bossing” is comprised of 3 episodes. The first episode entitled Sirena will be starred by Vic Sotto, Ryzza Mae Dizon, Manilyn Reynes, Pauleen Luna, and Wally Bayola. In the episode, there is a little girl ( Ryzza Mae Dizon) whose wish to be a mermaid was granted with the help of Tandang Wishy (Pauleen Luna). The little girl transformed to be a mermaid-goldfish hybrid and is up for a journey. On the second episode Taktak, follows a story of a phony medium (Ryzza Mae Dizon) that deceives people that is desperate to talk to their dead relatives. A TV host/investigator thinks that the medium is a fake, but his executive producer (Marian Rivera) believes she is a real deal. On the last episode, Prinsesa, follows journey of a lost princess (Ryzza Mae Dizon) that was separated from her royal parents since she was born. Catch her journey towards finding the truth about herself. The film will be showing on December 25, 2014 in cinemas nationwide.